Every couple of months, an uplifting story comes out about a kindly senior citizen enjoying a pint of Guinness or a bunch of bacon every day, and old age starts to sound like one big endless Sunday morning. But a report this week has struck a decidedly different tone, and it was weirdly refreshing -- and by "weirdly refreshing" we mean: maybe the darkest piece of journalism ever published. The utterly bleak article in The Sun outlined the life of a woman Russian officials are claiming is the "oldest ever human." 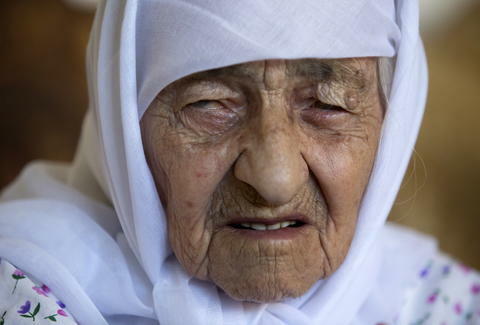 Her name is Koku Istambulova, and she claims in her 128 years, she has not “had a single happy day in my life. I have always worked hard, digging in the garden." Nor did she share any advice on how to reach a ripe old age. The Sun points out that if these claims are true, Istambulova would've been 55 when World War II ended. But there is some reason to doubt them. For one, if her age is accurate she'd be six years older than the person previously considered the oldest human ever. The Pension Fund of the Russian Federation, which is making the claim, cites her internal passport, which shows her birthdate as June 1, 1889. But all of Istambulova's documents were reportedly lost during the early 2000s in the Second Chechen War, which makes her age impossible to verify with birth records. Though her eyesight is failing, she is "articulate and able to feed herself and walk," which is impressive for someone who has seen three different centuries, and it's sort of comforting to hear Koku Istambulova is in relatively good health, if not spirits.